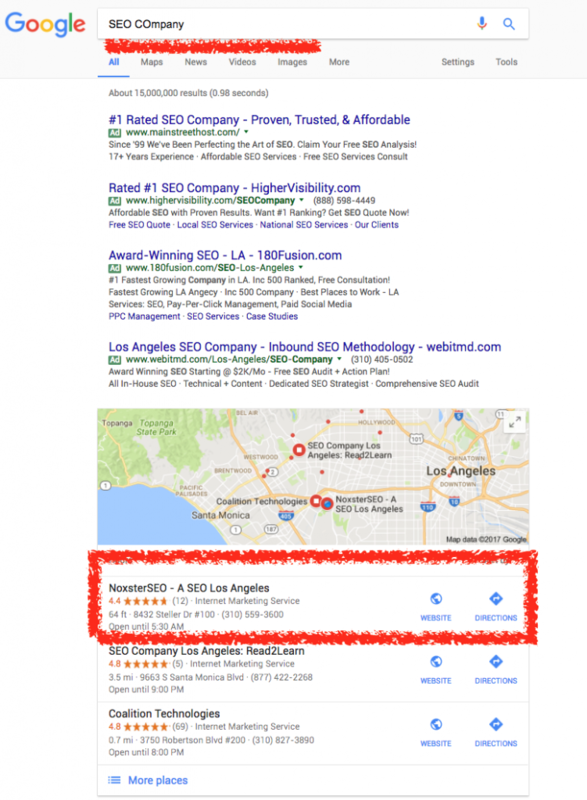 SEO Companies in Los Angeles are transforming, Los Angeles as a city is growing, and you are in the middle of it, not knowing who you should trust. All you know is that you have talked to people and everyone claims to be the best SEO Company in Los Angeles. There are a couple of reasons why you should consider Noxster when determining which local SEO Company you want to choose. With the growth of virtual office and technological advances, anyone with a computer could claim to be an SEO Firm or SEO Expert. It’s important to find an SEO company like Noxster who you can turn to for all of your search engine optimization needs. Our parent company has been around for 40 years, and when you walk into our Los Angeles SEO Company, you are going to find a team of professionals who remain dedicated to doing what is in your best interest. All of our SEO packages are on an hourly retainer which you will see substantial work done each month. SEO should be transparent like any other professional services offered by a company. A good SEO Firm in Los Angeles will be able to provide you with 100% transparency of their work, where time is allocated, and how much work is implementation vs. research and development. Los Angeles search engine optimization services are evolving. There have been multiple updates to Google’s algorithm that has affected how companies are doing SEO. Ranking for top keywords isn’t by accident. You have to put together a robust strategy that makes you the Social Authority within your industry. Whether you are small to medium, business to business, or consumer based, it’s essential to be at the forefront of the search engine to generate inbound leads through search engine optimization. If you are in a competitive geographical location such as Los Angeles, SEO is even more critical due to the level of competition within each important industry. It doesn’t matter if you sell maid services, hardwood floor, computer repair, printing, or online marketing services, there is competition online vying for the top 3 positions. Elements such as price point, UI design of your website, value proposition, and other features determine if your site converts and stand out from the pack. However, SEO in Los Angeles has individual items that need to be placed on your site to make sure it is performing at the optimal level. When you hire an SEO Los Angeles Firm provider, you don’t have to bother about the complicated algorithms of all three major search engines and the technical logic driving it. There are over 250 variables that Google looks at now in identifying what they consider the high-quality website. By partnering with Noxster, you do not have to have the anxiety of “guessing” and doing SEO on your own. Our digital agency is available to help consult and explain to you the basic search engine optimization principles and making sure we implement “white hat” methods. Outsourcing the project to us takes away HR expenses, technological stress, as well as hiring a team of internet marketing professionals who specialize in each element. That way you can focus on your business which is your expertise. The SEO Industry has a lot of “companies” who claim to be major players within the industry; however, there is no such thing as an SEO certification to determine which company you can trust. Having an outlined plan of action, marketing strategy, and data analysis will allow your partnership with Noxster make you feel at ease. Trying to break down all of the data can take you months to put together let alone the implementation of the core principles. 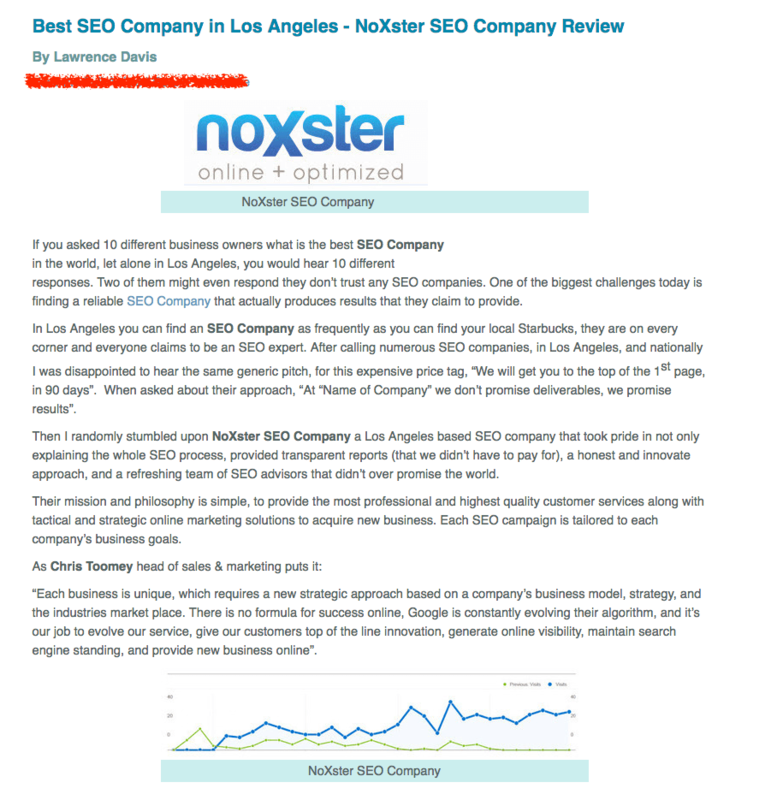 That is why Los Angeles ranks Noxster the #1 SEO Company and service provider based on our expertise and knowledge. Southern California has been the home of Noxster and Southern California Graphics for over 40 years. Before Noxster and still operating, SCG is Noxster’s parent company. Family owned and operated; both companies work in the same building since 1974. Noxster and Southern California Graphics have found a synergy operation together. When you are looking for SEO consulting you can come in and work with use face-to-face without the uncomfortableness of a working within community space, or out of a small virtual office. Noxster has a real brick and mortar with three client lounges, a process room, and full kitchen for customers to come in and have lunch. Los Angeles SEO Consulting Services is different than traditional SEO Services that our company offers. The retainer for strategic management helps clients brainstorm a plan vs. integrating the plan of action. SEO has transformed to a multifacet service, where it’s not as easy as hiring just a individual. Social Media, Content, Blogging, Onsite Optimization, Local Optimization, and Link Building are different time requirements to get a website ranked on top of the search engines. If you haven’t read the new report from SEMRush on Google’s strategy for bidding, you should read our blog about your Pay Per Click Strategy. Product or eCommerce companies are significantly affected. With the new Google Updates; it’s tougher to find a reliable SEO Company in the Los Angeles area who has your best interest at heart. You probably get 100’s of phone calls a day soliciting you for your business. If you are local Los Angeles company and you all are looking for an SEO Firm, and you are a medium to small size business or even a large enterprise looking to generate traffic to your website, increase brand awareness, and maximize sales then our Los Angeles search engine optimization firm is the perfect fit. Noxster implements strategic search engine marketing solutions tailored to businesses looking to see real results. Our organic SEO Company in LA process performed domestically in the United States, so everyone you work with is out of our Los Angeles, California location. The good thing about Noxster is that we only work with only two companies per respected industry, so we don’t leverage our relationship to prospect your competitors. Every SEO technique is white hat and has done for our website. It how we have outranked thousands of other companies, and we weren’t the first company to have “SEO Company” at the top of our website. We currently are ranked on the 1st page of Google for the most competitive phrase in our marketplace SEO Company, not just in Los Angeles, but domestically around the United States. Noxster primary focus is servicing companies who are looking for internet marketing, SEM, Social Media, Web Design, and SEO within the Los Angeles area. LA is a huge metropolis area representing over 300,000 businesses. Los Angeles has a combination of small shops to large corporations in need of being found for local keywords. L.A. is one of the best cities for local businesses to offer their products and services. Noxster helps you drive more business, increase sales, generate more leads, increase traffic, and complete your brand awareness. Whatever your business goals are we can help get you over the hump. Stop talking to one man operation and come to a firm that provides proven services in Los Angeles. Splash Magazine has ranked us as the BEST SEO Company in Los Angeles, and it is for a good reason. We offer high-end SEO Los Angeles services to the local LA area. Noxster can provide you superior internet marketing services such as Pay Per Click Management, Web Design, Social Media Optimization, and search engine optimization. Ranking on the search engine is sophisticated. There is a lot of daily monitoring that goes into your Los Angeles SEO services. We have a team of professionals to make sure each element is acting optimized. With an increase in the need to separate your company from a crowded city, SEO services and online marketing has become increasingly more important. Setting yourself apart from the pack, however, isn’t as easy as it used to be. Securing high organic rankings on Google within the L.A region is one of the most competitive geographical areas to rank for due to many companies residing within the area. LA SEO Services allow you to increase your rankings on Google and the other leading search engines giving your business the opportunity to increase your ROI by driving targeted local visits to your website or storefronts. Google has a new update focusing its attention on the Google Map section within the first page. You now see only seven organic listings and three additional companies on the top of the page within the map section. This Google update gives you the opportunity to list your local Los Angeles business in the maps section and Google will give us SEO Companies the data such as, “direction request,” “number of calls in each location,” “images viewed” and other calls to actions. It also allows your local business to capture inbound leads without a client even landing on your website. Noxster includes Local Optimization in our Los Angeles SEO Services. We optimize your business listing to make sure your clients find you in the Local Google section. When working with Noxster, we promise to only take on two clients per respected industry. So when we are choosing keywords, you do not have to worry about us competing with clients in your industry. Google only allows 10 companies to be on the first page of Google, so when you type in your Los Angeles-based key phrase, you can be assured you and only 1 other company will be managed under our watch. With that being said there is almost no major verticle that we haven’t been successful with. We can show you a strategy to get you to the top of the search engine. Working with the most affordable or most economical SEO company is probably not even a company at all. If your prospecting new SEO consultants then they will give you paid ADVISE not substantial work. NoxsterSEO regularly consults with our clientele and new prospects to advise them on SEO strategy. However, the retainer is completely different than SEO Sevices. You will only get you to waste money earlier vs. saving money later. Not to mention the lost opportunity for a couple of months you have been with the un reputable SEO Company. Local companies are our priority. We have developed an excellent reputation in Los Angeles due to hard work. So while we do take on business from other states, we start locally right here in Los Angeles. So when you are looking for possible references or ranking reports, you will be able to see local SEO work that we have done for your neighbors. Since our inception, we have targeted the local Los Angeles community to help grow our business. We rank for over 300 keywords related to Los Angeles based SEO Services. So when you type in keywords related to our niche, it’s not going to be by coincidence that we show up on page 1 of Google. The best part is that it doesn’t matter if you are a medium to small size company in LA. Noxster has optimized and worked with businesses of all sizes. In online marketing, every business has a different business model in which Noxster takes the liberty to optimize. At Noxster our Los Angeles SEO services have always been one of the best ways for small to medium size companies increase the awareness of their business. We have worked with billion dollar entities in Los Angeles and California with search engine optimization services and Los Angeles web design solutions.We have also worked and partnered with many small businesses providing local SEO services. Dominating your backyard is the first step to search engine optimization success. If you want to improve search engine rankings and bring more online exposure to your company? Let’s play a game of Phone Tag, You’re It! Call us directly at 888-507-4944 or email us at HiFriend@nseoc.com.